Mr Van Rompuy: "We fully support the efforts of the Greek government"
EU leaders say they are ready to act to shore up Greece's finances and ensure stability in the eurozone - but they have made no specific promise of aid. Greece must take further measures to tackle its huge debts and cut its budget deficit by 4% this year, the EU leaders said after a Brussels summit. The statement did not spell out what was meant by "determined and co-ordinated action, if needed". Greece's debt crisis has put pressure on the euro, making markets nervous. Financial markets initially rose on the news of EU support for Greece, then fell back as analysts questioned the lack of detail. Other countries with big deficits in the 16-nation eurozone, such as Portugal and Spain, are seen as vulnerable if Greece's problems are not tackled resolutely. Greece's deficit is, at 12.7%, more than four times higher than eurozone rules allow. For years Greek spending has ballooned while tax revenue has diminished. 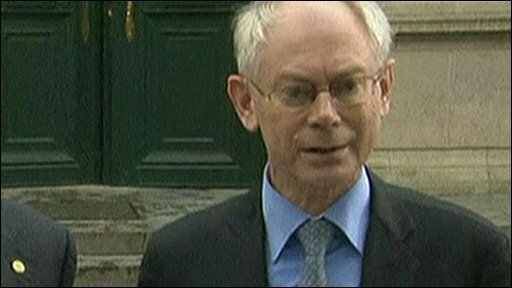 The President of the European Council, Herman Van Rompuy, stressed that Greece had not asked for financial aid. The summit statement said: "We fully support the efforts of the Greek government and their commitment to do whatever is necessary, including adopting additional measures to ensure that the ambitious targets set in the stability programme for 2010 and the following years are met. "We call on the Greek government to implement all these measures in a rigorous and determined manner to effectively reduce the budgetary deficit by 4% in 2010." Greek Prime Minister George Papandreou said his country was ready to take the extra action needed to reduce its deficit. "If it is necessary we are committed to take these additional measures to achieve our targets," Mr Papandreou told reporters in Brussels after the summit. German Chancellor Angela Merkel said Greece "will not be left on its own, but there are rules and these rules must be adhered to". If the financial market riposte to the Greek bailout is anything to go by, we're not yet out of the woods. The euro gained... but then fell back more. European currency traders soon twigged that this was only an accord in principle, with most of the costly details still to be worked out. Many, including Britain, would have preferred the IMF to have brokered some kind of rescue. But here the reputation of the euro was on the line. For heads of state, avoiding armageddon for Brussels' single most important achievement took priority over the unfortunate side-effect - our old friend moral hazard. The unfortunate but potent side effect of this rescue is that it sends the message to the rest of the pack that if euro nations keep spending beyond their means for long enough, Germany and France will ride to the rescue. The BBC's Dominic Hughes in Brussels says the details of any EU help for Greece may not emerge until Monday, when eurozone finance ministers will meet. It is the first big test for Mr Van Rompuy, who wanted the summit to focus on a new strategy for jobs and growth - a blueprint for the next 10 years. But defending the euro is now a more pressing issue. EU rules prevent the eurozone from collectively bailing out Greece, but the debt crisis has forced EU leaders to seek ways to help nevertheless. UK Prime Minister Gordon Brown stressed that "the discussions at the moment are within the euro area", when asked if UK taxpayers' money would be part of any EU aid. The markets remain sceptical that Greece will be able to pay its debts. Any EU budget support for Greece is likely to come with stringent conditions, to ensure that Athens fulfils its austerity plans and to reassure European voters that their taxes will not be diverted to propping up Greece. Its debt is about 300bn euros ($419bn; £259bn), and the government estimates it will need to borrow about 53bn euros this year to cover budget shortfalls. Debt servicing is now costing Greece 11.6% of its gross domestic product and it has to pay more interest on loans now because its credit rating has been downgraded. In addition, the European Commission may decide to disburse regional aid to Greece earlier than planned. They have asked the European Commission to draft additional measures to be taken by Greece, "drawing on the expertise of the IMF". The EU will assess Greece's implementation of the austerity plan next month. The Commission is also working on a blueprint for the EU's long-term recovery and growth, called Europe 2020, which is expected by early March. It will replace the Lisbon Strategy, launched in 2000, which became a victim of the global financial crisis and of fiscal rule-breaking by EU governments.